Like many of you, I&apos;m fortunate to be able to visit Disney World and Disneyland pretty frequently. But where I&apos;ve received an extra dose of luck is that I also visit the international parks on a regular basis, due to having a job that sends me all over the world. I&apos;ve been going to Japan annually for as long as I can remember and almost always find a way to get to Tokyo Disneyland while I&apos;m there. Shanghai is also an annual stop and I waited impatiently for years for Shanghai Disneyland to open (and it was worth the wait). I frequently fly through Hong Kong to get where I&apos;m going so I figure, why not stop for a night or two? And I&apos;m in Germany once or twice a year and Paris isn&apos;t really that far away, is it? So, while I know other Disney fans who have taken once-in-a-lifetime trips to these international parks, I&apos;m fortunate enough to be able to visit them on a fairly regular basis. That led me to thinking that others, who don&apos;t have the opportunity to travel internationally as often as I do, might be interested in learning a little more about those parks. 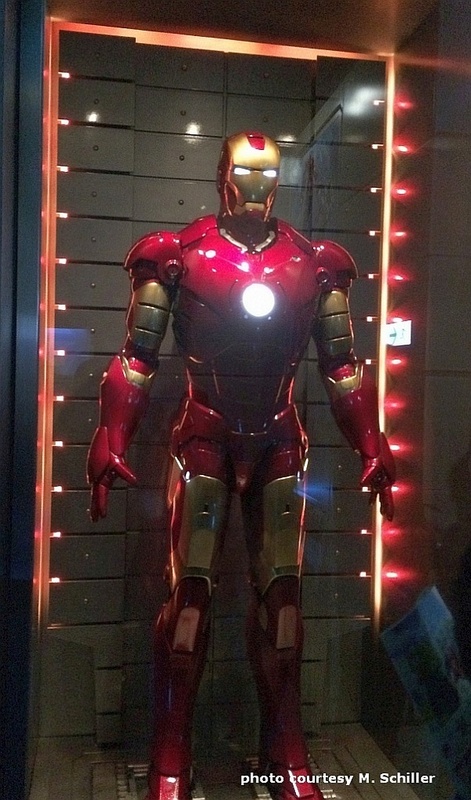 The focus of this article is the brand-new Iron Man Experience at Hong Kong Disneyland. Iron Man Experience opened earlier this year and is the first major Disney attraction featuring the Marvel comic book characters. I was flying through Hong Kong on my way into China for a business trip in March, and it was a no-brainer to stop for a night on the way to check out this new ride. I arrived in Hong Kong from the U.S. early evening on a Friday and grabbed a taxi to my hotel at the Hong Kong Disneyland resort. For this visit, I was staying at Disney&apos;s Hollywood Hotel, one of two Disney resorts in Hong Kong (although the third Disney resort, the Disney Explorers Lodge, opened a month after my visit… which gives me a reason to stop in Hong Kong again my next time through). The Hollywood Hotel is the less expensive of the original two Disney hotels. Like at Disneyland in California there are no Value resorts in Hong Kong and they will all set you back at least $300 per night. The Hollywood Hotel has a fun, old-time Hollywood theme, complete with a walk through the streets of Hollywood behind the hotel. Valiantly fighting off jet lag, I dropped my bags off in my room and hopped on the shuttle bus for the five-minute ride to the park. I arrived around 6 p.m. and made a beeline for Tomorrowland, where the Iron Man ride is located. The Iron Man &apos;area&apos; is tucked in a far corner of Tomorrowland, past Buzz Lightyear Astro Blasters, and consists of three spaces: a gift shop, an Iron Man meet-and-greet, and the ride itself. The story is that Tony Stark is holding a Stark Expo at Hong Kong Disneyland (similar to the one held during the film Iron Man 2), so everything is themed along those lines. It&apos;s actually a clever way for the whole thing to make sense and seem more &apos;real&apos;. So as you walk past the Buzz ride, to your left is the Expo souvenir store, followed by an entrance into the Tech Showcase where you can meet Iron Man himself. Or you can walk straight ahead to the main Expo (which is the building containing the ride). As you wait in line for the ride, you get to examine the Expo displays, which include items from Stark Industries&apos; past as well as new tech from Stark. In the historical section, you see things such as a prototype of Captain America&apos;s shield and an early version of the Iron Man armor. The displays and information in this part of the line make it clear that the ride is based more on the movies than the comic books (given that there are photos of Captain America, and it&apos;s Chris Evans as Cap in the photos). Once you get past the historical stuff, you start seeing some of the new tech being developed by Stark and it&apos;s mostly different kinds of vehicles (which will come into play later, on the ride). After grabbing your 3D glasses, you eventually reach the loading area for the ride. It has a distinctly Star Tours feel to it. It&apos;s the same layout, with multiple loading bays. In fact, the whole ride is clearly a reuse of the Star Tours ride system and layout, just with a different storyline. The concept is that Tony Stark has invented the Iron Wing, which is basically a large version of the Iron Man armor that seats about 45 people. He&apos;s going to give you a ride on the Iron Wing, with a sight-seeing flight over Hong Kong. What could go wrong? As you&apos;re waiting to be loaded, the obligatory instructional video informs you on how to perform complicated tasks such as buckling seat belts. One bit of greatness though is that Stan Lee is one of the folks shown seated in the ride vehicle during the instructional video. Once on board, the view screen opens up to display the hangar in which your Iron Wing rests. There&apos;s some kind of malfunction with the hangar door that delays your departure, but Jarvis (who&apos;s controlling the Iron Wing), blasts them open, much to the displeasure of the hangar crew. It&apos;s at this point that your vehicle lifts off, leaving the hangar bay. Keeping with the storyline, you first fly over Tomorrowland and the rest of Hong Kong Disneyland before proceeding to fly to downtown Hong Kong, As with Star Tours, the ride vehicle moves in concert with the video in order to simulate flight. Just as you&apos;re reaching the pinnacle of the tour, which is a visit to the new Hong Kong Stark Tower to disembark and see the new arc reactor, you are viciously (and unfairly, I might add) attacked by Hydra robots (which look strangely similar to the robots from the Incredibles). Why, you might ask? Well, they want to steal the arc reactor, which apparently would be bad. At this point, Jarvis puts in a distress call to Tony Stark (aka Iron Man) for assistance. Again, they do a nice job of maintaining consistency with the storyline. Iron Man is shown on the video screen as Jarvis converses with him. He&apos;s posing with fans at the Tech Showcase, in a room identical to the one where you can meet Iron Man at the park. He first says it&apos;s a bad time because he&apos;s busy connecting with his people but of course gets his priorities in order when he hears that we&apos;re being attacked by Hydra and says he&apos;ll be right there. By the way, some of my understanding of what is being said is a bit of educated guesswork. Oddly, Jarvis speaks in Mandarin and Iron Man speaks in English, assuring that everyone will understand some of what is going on (and almost no one will understand all of what is going on). This is a bit like how they do things at Disneyland Paris, where shows will switch back and forth between French and English. As for me, I was just grateful that they provided some English accommodations (although hearing Iron Man speak Mandarin would have been entertaining as well). Also, in case you&apos;re wondering, as best I could tell, Robert Downey, Jr. did not voice Iron Man. But they did get a &apos;sound-alike&apos; and obviously based his personality on the Iron Man in the movies. Anyway, once Iron Man arrives to save the day, a battle ensues on the streets of Hong Kong, where it&apos;s raining and there are lots of innocent bystanders. Iron Man and the robots are pretty clearly animated but the people appeared to be real (to me, at least) so it was an interesting blend. Iron Man does most of the heavy lifting but, with Jarvis controlling the Iron Wing, we take down some of the evil &apos;bots ourselves. After defeating the robots, Iron Man congratulates us on a job well done, only to find out that there&apos;s another mega-sized robot now attacking Stark Tower to get the reactor. Iron Man then summons the other vehicles from the Expo at Disneyland (the ones we saw while waiting in line) and all of the vehicles, including our own, fly into the big robot together. There is more blasting and more fighting and then, spoiler alert, our vehicle eventually takes the kill shot and saves the day. Iron Man then rightly gives us credit for being heroes. Personally, I felt that Jarvis and I did most of the heavy lifting and that the other 44 people in my vehicle failed to carry their weight. But I&apos;m not keeping score and I was just happy to do my part to help. Wouldn&apos;t you know it, at that point our engines fail and we almost plummet into the bay. But Iron Man saves us and tows us back to Hong Kong Disneyland, where we receive a well-deserved round of applause from the hangar crew. I managed to ride Iron Man Experience three times and think it&apos;s an upper-tier Disney ride. It has some good motion effects, just like Star Tours, and even a touch of &apos;4-D&apos;, when Iron Man crashes through our windshield and we feel wind blowing in. It has a good story but the experience is identical from one time to the next, unlike Star Tours. It didn&apos;t blow me away as something new and different like the Shanghai Pirates ride or the Paris Ratatouille ride. Iron Man Experience isn&apos;t quite a home run but it&apos;s a solid triple. It is well worth a ride (or three) if you get the chance to visit Hong Kong. It also represents a good start to Disney using the Marvel characters in a significant way. Several members of the AllEars® team have been to Hong Kong Disneyland over the last few years (though all before the Iron Man Experience opened). You can read about their travels in our Hong Kong Disneyland blog archives HERE. Mike Schiller is a frequent visitor to the six worldwide Disney theme park locations and is currently nearing the end of his long quest to stay at every Disney-owned hotel around the world (36 down, 6 to go). He lives in Dallas with his wife and two kids and is a published author with McGraw-Hill as well as the Chief Information Security Officer at a Fortune 500 company. Mike also enjoys watching baseball in his spare time and has attended games at every major league stadium.